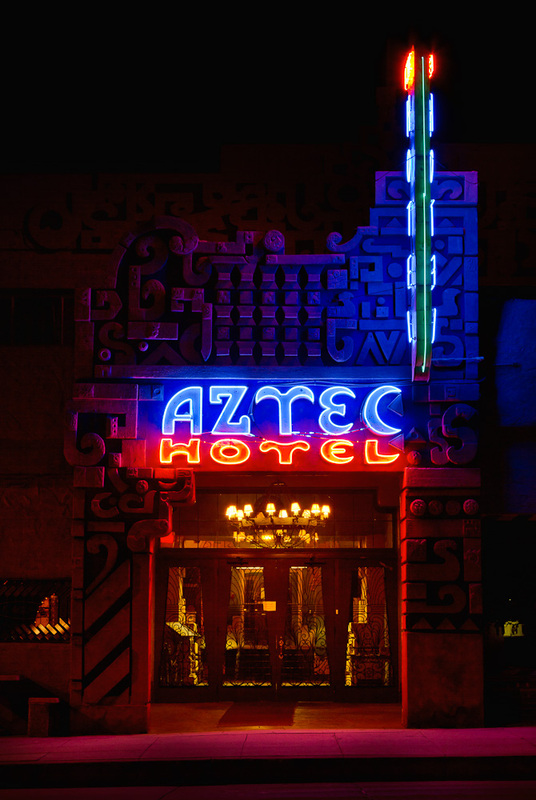 I posted a somewhat similar, but from an angle, photo of the front entrance to the Aztec Hotel back on April 14th. This one is a straight on shot looking in the front door. The Aztec Hotel has been in the news recently and I won't pretend to know or understand all the details or intricacies of the situation. I just hope that, since the Aztec is such a fascinating place with a rich history, everything works out for the best in the end. I'd hate to see the historic Aztec Hotel become just a memory. I haven't read the article yet but I'm sure this is on the register of historic places (and all other registers). Laurie did an interesting article on the Rialto Theater in South Pas. In profit hungry America, when something doesn't earn it's keep, they'll put in something ugly (more often then not) that will.